Archbishop Tutu slams the USA for inhibiting free speech! The former Archbishop of Capetown is now 82 years old and he’s been doing his best for some time now to slip into a quiet retirement. The problem is that the man has the heart of a prophet and he simply can’t contain himself and remain silent in the face of injustice and oppression! Tutu and Jeremiah, it seems to me, were cut from the same prophetic cloth. While the Palestinian Occupation continues in all its brutality, and indeed becomes even more brutal as more and more land is gobbled up by ‘settlers’, how can a man who has given his life to fighting oppression not speak out! 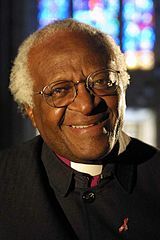 As articulate as ever, Tutu makes a point that I hadn’t considered before – that the comparison that is sometimes made between supporters of the “boycott, divestment and sanctions” campaign and the Nazi’s of World War II is not only horribly insulting to the upholders of BDS but also trivialises the horrors of the Holocaust! Tags: Archbishop Tutu, bds, divestment, palestinian occupation, time, USA. Filed under israel and palestine articles by Father Dave on Apr 10th, 2014.